Hello Nosh Show Listeners! Episode 93 is ready for listening. There's not a ton of product followup as we enter the holiday season, but I do have a few things to cover here. Oh, my Nosh (and Not) of the week is the two Kemps froyos I posted this week (#1 and #2). I think those of you who love salty caramel flavors should enjoy one of them at least. 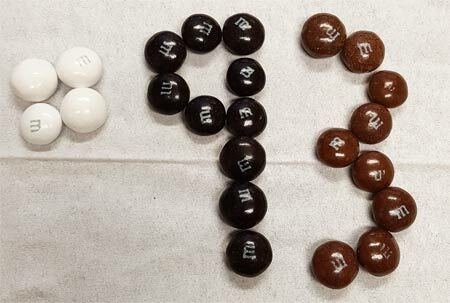 I've mentioned before that I've grown very tired of regular M&M's, but I still enjoy the other varieties like peanut M&M's and dark chocolate M&M's. Here we have both regular milk chocolate and dark chocolate together in a larger form factor, so will I like it? Actually I do and I grew more fond of these the more I ate them over the course of a week or so. While I still don't enjoy theit familiar milk chocolate taste, the larger size of these combined with a bit of fun texture from the two kinds of chocolates makes these enjoyable. That big squish of chocolate with a nice note of darkness makes for a neat snack. I wouldn't say they're perfect, but it's definitely worth a try, especially if you like dark chocolate M&M's. Thought question: During the episode, the guys have fun teasing me about my love of pretzels. At my one job, I would chow down on a bag of pretzels and a Snapple lemon ice tea every afternoon because I loved the pretzel/tea combo. During my younger years I would also partake in the mighty pretzel/cola combo. I just think that each piece makes the other one come alive. This is also why I find it hard to eat a sandwich without chips (or fries). So, how do you enjoy pretzels? I think they can be best when you balance them with something and in general that's a sugary drink for me, though deep down I would just eat chocolate covered pretzels all the time if I could. Alright, have a good week everyone. We've got our first snowfall today which means it's time to buy myself some new tires. Oh the excitement! 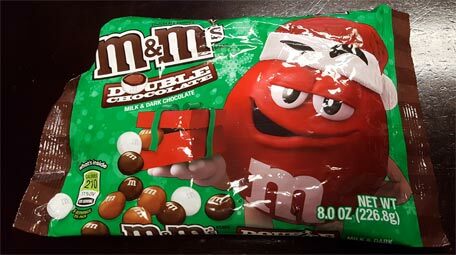 I personally was not wild over the new M&M double chocolate variety. Even my kids did not seem to care as much for them. I think it's the larger size that we don't like actually. A classic pretzel with hot cocoa is great for the sweet and salty combo. I used to love M n Ms as a kid. Twas my favorite candy. But out of belief and necessity, my go to chocolate these dayd are regular hersheys kisses. Since they went fully non GMO, removed most artificial ingredients, and started using cane sugar instead of corn syrup or beat sugar, I have started eating chocolate again. I will reward companies that do good. @Anne: I can see that. I was so-so at first but like I said they grew on me.